Looking down the list of pitchers for the Colorado Rockies you see the new norm in Major League Baseball. Dozens of pitchers file into Spring Training looking to capitalize on an offseason of work as they prepared their young bodies for the rigors of a 162-game baseball season, most of them born between 1975 and 1989. There is one exception on those back fields of Arizona amongst the mass of players convened to fight for a major league spot. Jamie Moyer. Born November 18, 1962. 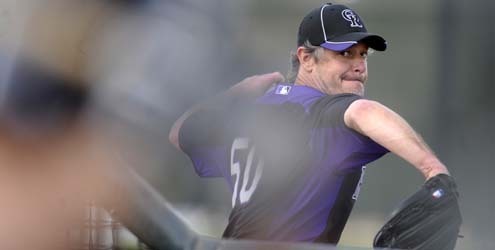 Moyer, who made his major league debut in 1986, is one of the many who are in Rockies camp fighting for a job. His, though, is an unusually uphill battle. You see unlike most of the pitchers in camp he is fighting to change perception. Can a man who made his debut for the Cubs and faced Mike Schmidt and the Phillies actually make the team coming off Tommy John Surgery? Think about that for a second. A surgery meant to give new life to pitchers is now giving new life to a man who has exhausted the others already. You see Moyer was on his way out of baseball in 1991 at the age of 28 (to put this in perspective, I was 7 in 1991 and, ironically, turned 28 today). His career labeled “fledgling” after sub-par performances in Chicago, Texas, and St. Louis. Something then clicked in Baltimore while on a staff with Mike Mussina, Rick Sutcliffe, and the recovering Fernando Valenzuela he put together a decent season. Three years later he was in Seattle where that perception of Moyer as middle of the road fourth starter changed. The perception of him changed as well. In Seattle he went (126-87), had two 20-win seasons, and started the All-Star game in 2003. He finished in the top-7 of Cy Young award voting three times. Then he was sent to Philadelphia where he continued to be a solid pitcher and even winning a World Series title with the Phillies in 2008. That season he went (16-7) with a 3.71 ERA at age 45. Over the next two seasons he bounced between the rotation and the bullpen. Even had it ended there it would have been an astonishing career for a man who was finished in baseball 17 years earlier. But here is Jamie Moyer at age 49, coming off of major elbow surgery, and playing for a team whose stadium isn’t known for keeping the ball in the park. Not many understand why he does it. At almost 50 and, presumably, set financially why would he come back two years after throwing his last pitch? There are cliches to be spoken here. His love of the game, his competitive spirit, his will to prove people wrong. I for one am under the impression that the answer, apart from those things, is very simple. Jamie Moyer is pitching because he can. I won’t bet against the man or put him down for going out and trying to pitch again in 2012. Not many of us in society have the opportunity to go out and do something we love for the simple reason of we have the ability to do so. For Moyer, some will call it a redemption story to prove the masses wrong. I say lets just look at it as what it is, an individual continuing his passion because he is allowed to do so. In the end that will be his greatest feat. Changing the perception on why individuals, athletes included, do the things we do.